Pioneers in the industry, we offer packing conveyors, pharma packing conveyor and packing conveyor from India. Our comprehensive range of Packing Conveyors (GMP Model-SMS-18) is used for feeding product to the hopper of packing machine. These conveyors comprises of pulleys, rollers and inclines that facilitates the conveying of products from one place to another. Available at highly affordable prices, these conveyors are widely demanded in the global market. 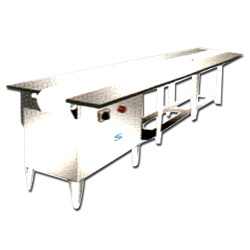 By possessing rich domain expertise, we are capable of manufacturing and exporting the Pharma Packing Conveyor. Provided conveyors are developed with inclined that help these in feeding the products to the hopper of packaging machines. Our wide gamut comprises of rollers, pulleys and inclines that assist in conveying from one place to other. Available at competitive rates, our Pharma Packing Conveyor is stringently tested to ensure its longer service life. Direction of Control Inter Mediate Drive. Owing to our rich industry experience, we are able to offer Packing Conveyor (GMP Model-SMS-12) that is ideal for cartoning and manual labeling operations. 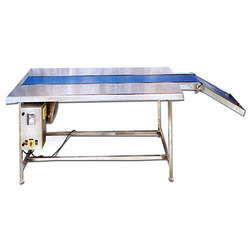 We manufacture these conveyors using duly tested components that ensure optimum quality and long serviceability. Further, we also provide customization facilities to our clients at highly affordable prices.